There are several breeds of flat-faced cats popular in the US and they all face a specific though hardly overwhelming challenge when drinking. Not recommended for these breeds is a deep, wide or flat drinking bowl where they must bring their faces all the way down to the water. 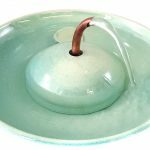 A wide bowl requires their whiskers to be in the water and with a deep bowl, as the water level drops they will find themselves with their faces ever deeper into the bowl with their whiskers getting wet. If the bowl is also from three to seven inches wide their whiskers will also get crimped. 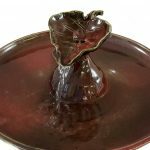 A drinking fountain with a narrow, raised area above the main water source from which to drink, such as is found in our Raised Upflow cat fountains, and certain Stream fountains. 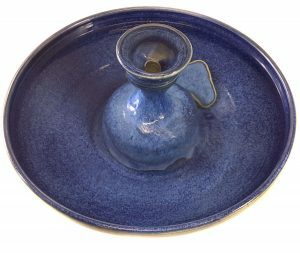 With the Raised Upflow drinking fountains the cats’ tongues can easily access the water with their whiskers outside the drinking area, remaining dry and un-crimped while the cat can drink to his heart’s content. Because the water is being constantly pumped into the upper basin the water is always accessible at the highest level. Also good for the flat-faced cat is a stream with the stream falling well clear of any other part of the fountain which may be in the way. 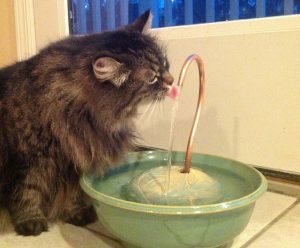 All of our Cat Taps serve this purpose as do many, though not all, of our stream fountains. If the stream is too short the cat will probably find himself drinking from it where it falls into the water, thus getting his whiskers wet. This certainly is no tragedy but if the cat finds it uncomfortable he may cease drinking too soon, thus not getting all the benefits thorough hydration provides. This design is also good for longhair cats. Below are more fountain designs suitable for flat-faced cats and kittens. The two on the left and right provide an upper drinking area and streams The center one (Serenity Flow) provides an easily accessed and independent stream. 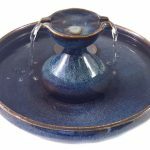 Visit our Shop to view our current inventory of ceramic cat fountains.